/ Get back to the TAP this fall! Do you know where our drinking water comes from? Do you know what it takes to pump and treat that water to get it to you? 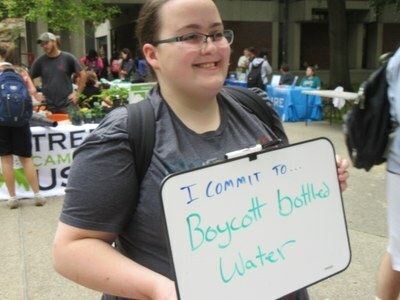 Do you know why Louisville tap is safer, cheaper, and waaaaaay better for the planet than bottled water? Just as a teaser, consider the economic value to getting back to the tap. Filling a glass 60 times with Louisville’s tap water costs just a penny. Consuming the recommended eight glasses of water a day from the tap costs around 50 cents a year, compared to $1,500 for buying bottled water. Explore the political & global concerns around water and the local success story. Louisville Water’s story of science & public health can bring real-world examples to your classroom, lab, or club this semester. The Louisville Water Company will gladly provide staff for guest lectures or offer tours. Contact Louisville Water Co.’s Kelley Dearing Smith to arrange a tour or guest lecture for your class, club, or other campus group: ksmith@lwcky.com or 502.569.3695.